It's no secret I love popcorn. This week, when it seemed like every teenager my kids know was at my house, I made popcorn for snacks. Yummy flavored popcorn, and not just the regular salt and butter. My favorite creation was Caramelized Onion and Goat Cheese. It was super easy to make. After popping my corn in my whirly popper, I drizzled it in about 3 T butter. Next, I crumbled up 3 T of Chavrie Goat Cheese with Caramelized Onion and tossed it in. The cheese blended well with the butter and spread all over the popcorn. Most of the teens gravitated to the sweet popcorns, but this savory and tangy popcorn was a nice treat that I was planning not to have to share! Little Miss grabbed the bowl and took off with it. She was not inclined to give it back to me, even to snap a picture. Hi MIcki, your popcorn sounds awesome. My grandson makes popcorn all the time. I'll have to ask him to make a special bowl for me and give this a try. Thanks for sharing this with Foodie Friends Friday Picnic Party this week. Ohhh this sounds like a delicious popcorn flavor!!!! 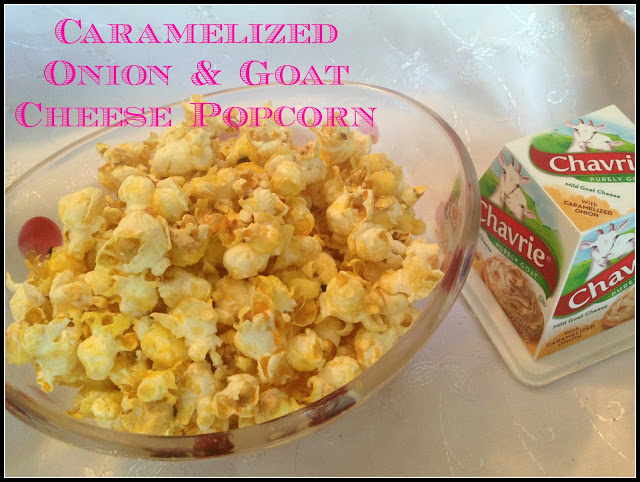 I love caramelized onions AND goat cheese, and this sounds delicious!! !